A "portable" computer with a tape drive? It's the IBM 5100 Portable Computer, one of the very first personal computers. This particular example has been expanded to 32K and originally cost $14,275 in 1976. The last time I visited the Smithsonian, they had a prototype of the 5100. 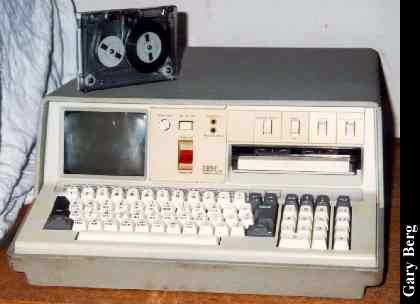 It had a tape drive that took normal cassette tapes, and a teeny, tiny little screen. The IBM 5100 Portable Computer was IBM's 1st attempt to build a personal computer back in 1974. Weighing in at 50 pounds and costing around $10,000, the IBM 5100 had a built-in tape drive, a small CRT and the capability of running programs in either BASIC or APL (A Programming Language, created by IBM). IBM used its own proprietary circuit modules throughout and did not rely on an Intel microprocessor, unlike the microcomputers that would come out in the following years. The monitor could display 16 lines of 64 characters each, the memory could be expanded to 64K, and the tape drive used a 1/4 inch tape cartridge similar to an 8-track stereo tape that could store about 200 K of data. Although designed to be a small business computer, the high cost and lack of interfacing capability limited the acceptance of what could be called the 1st personal computer, the IBM 5100. Click here to view all comments for the IBM 5100 Personal Portable Computer and to leave your own.